Recognizing your need for detailed ad performance data, we have added extra metrics to our Ad Set view (Promotion widget -> click on "..." -> Insights tab). You can now base strategic decisions about targeting and budgeting on these metrics: Amount Spent, People Reached, Results (based on Campaign objective), and Results & Cost Per Result over time. While Ad Set insights empower you to make strategic decisions about the right target, Ad Insights let them validate which content format works best for your audience. In order to meet advertisers’ needs and cover the entire cycle from planning, to promotion, to evaluation, we have enabled insights at Ad level. In the detailed view of each Ad, there is a new tab called “Insights” that shows: Results (based on Campaign objective), People Reached, Amount Spent and Results & Cost Per Result over time. These improvements in Ads reporting will optimize advertisers’ workflows and allow them to take effective decisions about recycling Ad Sets, allocating budgets within existing Ads and adopting a different targeting strategy. After the successful Beta launch of Facebook Custom Audience creation, we are now releasing the complete feature. You can export Falcon Audiences to Custom Audiences and Lookalike Audiences. Watch the below video and read more about how to create Custom Audiences here. “A picture is worth a thousand words” is a notion that Audience knows well and is now rephrasing it to “A profile picture is worth a thousand data points.” As part of our big plans for the future of social listening, Audience is introducing a Picture similarity service. Merge candidates are now sorted based on picture similarity, both on the Profile Card and the Merge tab. The feature will enable you to increase the relevance and the ease of manually merging social profiles. The potential matches are sorted based on a similarity score and all the profile information is still visible when merging on the Merge tab. Audience has also introduced a mini-chart in the Audience Card that shows the Audience’s growth trend over the last week. You can create a custom Audience by connecting different channels and in one glance see new users flowing into that Audience. This way you can benchmark your Audience growth by different channels/pages or lifecycle stages from your CRM. After bringing your social feeds to the big screen in real time with the TV mode, we have now introduced a mention sidebar in Listen that puts context to your report numbers. 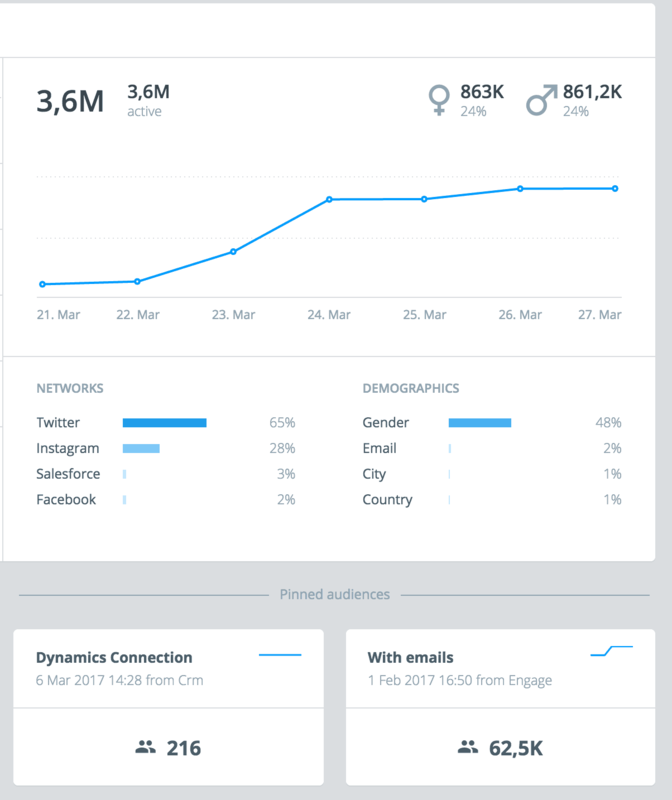 You no longer have to switch between the Insights and the Mentions view in order to get the full picture. Just click on a name, handle or graph point and the relevant mentions will automatically appear in a sidebar view. From here you can go to the mention view for further discovery and easily go back to interact with your reports. Marketers, we know you are not off the hook with ROI. And Measure is kicking it up a notch! Measure now allows you to export up to 3 months of channel data. With a single click you can download 567 Page metrics and 105 Post metrics in a CSV format, without spending extra time and effort in creating reports to visualize all the Facebook data. If you are short on time and need a quick overview of the most actionable insights, we have introduced Facebook Reactions for Pages, Consumptions and Most Engaged Users as a default module in Quick Reports. Measure is now also surfacing Impressions in the Reports for Page and Post level. In addition to total impressions you can now select organic, paid and viral impressions for Pages. The new Consumptions metric allows you to track consumption on both Post (Post Clicks) and Page level by having an overview of Link Clicks, Video Plays, Photo View and Other Clicks over time. Consumptions are only single value (total) for Posts, and are broken down into parts for Page. All these metrics are high value-added improvements, as Page and Post engagement metrics are a trusted source for Facebook marketing strategy optimization. Remember that you can always check our latest feature releases in the “What’s new” section of the platform without referring to the Help Center on the website.